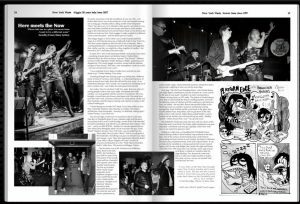 An article about Crazy Mary’s shows in London, UK is in NY Waste. It was written by our very own Emma Zakarevicius. It’s pretty amazing to write the soundtrack of your own life – and fiction does have a way of becoming fact. One cool moonlit evening not so long ago, I heard London calling and the wind whispered “Mary” let’s get crazy. So in attempt to defy gravity, our band of crazy men (and Mary) travelled across oceans and skies to write another page in the international rock and roll history book. In true technicolor fashion we took our New York swagger to make a splash in a different scene across the pond – and the dream got real. Quick. The intrigue began in 2014 when I saw London based band Pink Cigar at an AH Presents showcase at Sidewalk Café in New York City. The show nearly ripped my shirt off with its fire of intensity. After a wowing performance, I introduced myself to the band and suggested that, maybe, one day, we might do a show together in London…fast forward to 2017 and fantasy became reality. In April 2017, New York based psychedelic rock group Crazy Mary – consisting of guitar player and fearless leader, Charles Kibel, Nicholas Raisz aka Nick on drums, Armand “The Wizard “ Milletari on bass and the legendary Walter Steding on fiddle – packed up and shipped out. This unruly gaggle of rockers, armed with the ultimate weapon of love (music), shot into a new stratosphere. Look out world – we have arrived and we are crazy! “I was surprised at how sleepy London town was but we sure shook it up”. Walter Steding, Crazy Mary. Travelling through time and space gets you reeling into a different frame of mind. It’s a buzz, and a feeling – a cultural peeling away of layers to reveal new truths about the old and the new (you) – in an unfamiliar landscape. New sounds, new experiences and being out of one’s comfort zone – sure makes for some good rock and roll. So London. How for art thou? Cold? Yes, quite. But even when it’s raining people want to rock every night. And despite the chilly weather, we were greeted with the warmest of receptions. We even brought a crowd from out of town, pied piper style. Our most loyal fans from New York, Germany and even my Aunty Janina, all the way from Australia, took the leap to road trip and meet for a session in the cultural melting pot. “I loved seeing my favorite NYC band, Crazy Mary while on tour, they rocked the infamous Mau Mau Bar in London. The history, architecture, food and people – amazing. I’m definitely visiting again”. Yvette Thomas, Crazy Mary fan. Our second night on the town we tracked on down to the Mau Mau Bar on Portobello Road. It was a Monday night and the place was packed wall to wall. Frank Burridge, owner of the club extended his hand immediately and offered us an additional show stating “I like you” – and it was like BOOM. Another five minutes passed and our new friend Dave Renegade asked “oh do you know this guy, Frank Wood” (Destiny Services, New York City)…um yes indeed we do. Then asked “do you know Otto’s?” And it was all good in the hood baby. Everything was gravy (or should I say chips and vinegar…yum). Dave then generously offered to debut Crazy Mary’s album “Ripples of Chaos” on the UK airwaves and featured us on his “Dark Heart of Camden Radio” radio show. The journey had begun. Cheers. Our first show was at the Nambucca on Holloway Road. Back in the early 2000’s, the Nambucca gave birth to some of the forerunners of the nu-folk scene and has a beautiful 300 capacity room with a monster sound system. The line up included fellow Aussie singer songwriter Suzie Stapleton (imagine if Nick Cave and PJ Harvey had a love child) and the awesome “Straight on Til Morning” (dreamy, fuzzed out funk, danceable disco grooves). Fun times for sure with electric performances, audio ecstatic magic, intercontinental reunions, interpretive dance moves and a nightcap of who can eat the most chips. Next stop “The Do!!You!! Breakfast Show” with Charlie Bones. Late night digital coordinations and the invitation to “come and fly by the seat of your pants” resulted in an early morning trip to Dalston, to hang loose on NTS radio. The station is located along a short strip of what looked like beach combing shanties. And with the delicious aroma of chicken and ribs cooking in a pit barrel out front, we talked – the real deal. Bones interviewed Walter on his illustrious career as a painter, musician and historian; being managed by Andy Warhol and the scene back in the glory days. Charles talked music and politics and we got down to the nitty gritty of New York City life. When Bones asked Walter’s current position on art and the cost of living driving out artists – Steding replied – “artists always find a way.” Up up and away! We ended the whirlwind week mini-tour with two shows at the Mau Mau and it was lift off. Our Friday night introduction was pure seduction – old friends and new got a glimpse of the New York view as we rocked our grooves, hard. Ending on a high note, we headlined the Portobello Music Festival during London’s Bank Holiday long weekend at the Mau Mau, one of the various venues hosting music at the festival. Showcasing the heart and art of west London, the festival celebrates the area’s past and present music scene and cultural history. It was an honor to be included on a lineup packed with iconic musical figures. Full of color and delight, day turned into night and history came full circle. Pink Cigar tore it up, stirring a sonic rage of pure rock desire. I mused as I waited to take the stage thinking “Yes, dreams do come true”. Once an idea now made manifest in reality – We came, we saw, we ate, we rocked! And we’ll be back for sure! “Crazy Mary at the Mau Mau brought some New York to London and it went down a treat. The bar and the crowed loved it. Next time you jump the pond come back down to the Portobello and see us, love London”. Frank Burridge, Owner of Mau Mau.